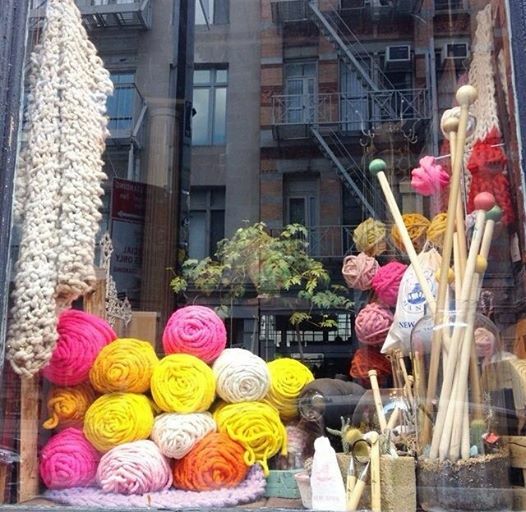 Have you ever wanted to have a movie set experience, but just couldn’t get yourself over to Universal Studios or the backlot of Paramount, and you happen to also be a massive fan of yarn? Then do I have a place for you. My dear husband whisked our toddler away for a few hours, leaving me in the middle of Soho, NYC to have a wander. I know I wanted to stock up at Uniqlo and have a gander in Purl but as I strolled along Grand, I stumbled upon Loopy Mango. The store was stocked floor to almost ceiling in yarn. But, not just your usual chain craft store variety. No, this was definitely different and special. They carried mostly chunky merino yarn in a wild assortment of colours. And to accompany such big yarn, were big needles. With light filtering through the store front window, it was like crawling into someone’s attic full of old memories and curiosities. Except this attic was filled with all sorts of samples of knitwear and all the accoutrements to make it. I had to stop myself from doing a running jump into the wall of yarn. I imagine it would have felt like a giant warm hug, or having a sleepover with a thousand of your closest tribble friends. ← Let’s Go to the Ex, Oh Baby! So funny! You are such a fantastically funny writer! Don’t you love the yarn scene in Hitchhiker’s Guide to the Galaxy?